Eight persons P, Q, R, S, T, U, V and W are born in two different months April and July in the four different years viz., 1972, 1977, 1981 and 1984. Only one person was born in one month of the each year. They are all speaking different languages like Telugu, Hindi, Guajarati, Tamil, Kannada, English, Urdu and Marathi but all the information given above are not necessary in the same order. The age of the persons are calculated based on October 2018. Two persons are born between P and the one who speaks Urdu. 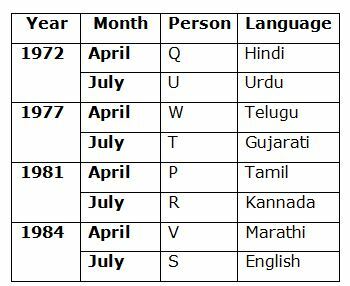 P was born in one of the odd numbered years but not in the month which has odd numbered days.Only one person was born between the one who speaks Urdu and the one who speaks Gujarati. Three persons are born between U and the one who speaks Kannada. As many persons are born before the one who speaks Telugu is same as after the one who speaks Kannada. U is elder than the one who speaks Kannada. T was born immediately after the one who speaks Telugu. Only one person was born between the one who speaks Hindi and W, whose age is not an even number. As many persons are born between T and the one who speaks Hindi is same as between S and the one who speaks Tamil. R was born immediately after the one who likes Tamil. R does not speak Urdu. S does not speak Kannada. The one who speaks Hindi is not the youngest person. More than three persons are born between Q and the one who likes Marathi. T and S are does not speak Marathi. 1. V is speaking which of the following languages? Two persons are born between P and the one who speaks Urdu. P was born in one of the odd numbered years but not in the month which has odd numbered days. Only one person was born between the one who speaks Urdu and the one who speaks Gujarati. Three persons are born between U and the one who speaks Kannada. As many persons are born before the one who speaks Telugu is same as after the one who speaks Kannada. U is elder than the one who speaks Kannada. T was born immediately after the one who speaks Telugu. Only one person was born between the one who speaks Hindi and W, whose age is not an even number. As many persons are born between T and the one who speaks Hindi is same as between S and the one who speaks Tamil. R was born immediately after the one who likes Tamil. R does not speak Urdu. S does not speak Kannada. The one who speaks Hindi is not the youngest person. More than three persons are born between Q and the one who likes Marathi. T and S are does not speak Marathi. 2. W was born in? 5. If T is related to Kannada and U is related to Gujarati in a certain way. Then, R is related to which of the following? 6. Which of the following elements will be fifth from the right end in the Step IV? One number and the one word are written at the beginning. The largest difference between the two digits are taken first and written at the beginning of the each step. The words are taken in reverse as per the English dictionary order and written at the beginning after the number. 7. How many elements are in between ‘19’ and ‘finance’ in the Step II? 8. 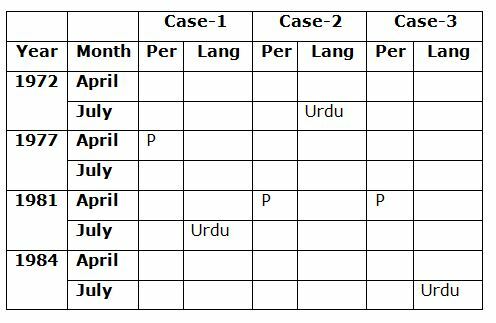 If ‘good’ is related to ‘96’ in Step IV and ‘59’ is related to ‘yearly’ in the Step V in a certain way. Then, ‘good’ is related to which of the following in the last step? 9. In which of the following steps the elements ‘earlier 96 finance’ are in the same order? 10. Which of the following elements is exactly in between ‘49’ and ‘earlier’ in the Step IV? 1) V is speaking which of the following languages? 2) W was born in? 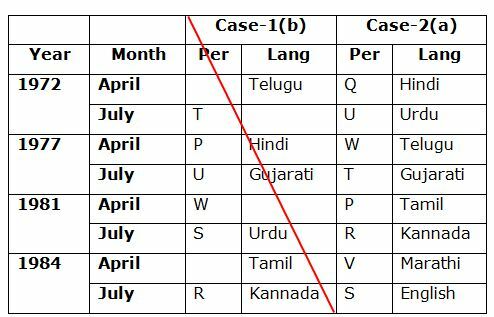 5) If T is related to Kannada and U is related to Gujarati in a certain way. Then, R is related to which of the following? 6) Which of the following elements will be fifth from the right end in the Step IV? 7) How many elements are in between ‘19’ and ‘finance’ in the Step II? 8) If ‘good’ is related to ‘96’ in Step IV and ‘59’ is related to ‘yearly’ in the Step V in a certain way. Then, ‘good’ is related to which of the following in the last step? 9) In which of the following steps the elements ‘earlier 96 finance’ are in the same order? 10) Which of the following elements is exactly in between ‘49’ and ‘earlier’ in the Step IV?